It is an easy read to take on holiday with you. I found the writing to be pretty good, although there was so much fluff before getting to the point. This book could have easily been condensed to 200 pages. There was a little twist at the end but nothing major. I was really expecting more of a thriller from this book but I didn’t find myself on the edge of my seat dying to find out what happens next. Erin’s decisions frustrated me the whole time, I just couldn’t believe someone would be that naive, and that really disconnected me from the main character. Also, I feel the beginning of the book gave away the thrill of finding out who would survive. All in all it was a good read but I expected a little more of a thrill. Enjoyable. Kept my interest right til the end. Good summer read. Although the suspense builds and builds in Something in the Water until you almost can’t stand it, the pace is almost painfully slow and deliberate. Author Catherine Steadman makes you experience every single excruciating moment, every what if. Of course I already knew the terrible thing that happened. It was right there in the first chapter. Or do I really know? Is there more, or something unimaginably worse? I had a sense of dread from the very beginning, like a dark cloud over the story that just kept getting bigger and bigger until it enveloped everything. I did not like Erin. Chapter after chapter I wanted to yell at her: What is wrong with you? Are you so greedy? So stupid? So selfish? So cold? She is arrogant, careless, reckless, deceitful, self-serving. She says she is afraid but she is very proud of how clever she thinks she is. Although Mark has several temper tantrums as he starts to worry about money, he initially seems to be the more cautious and thoughtful of the two. But I didn’t really like him (or most of the other characters) either. Erin asks herself at one point if she is bad person. This book is full of bad people. You never know who has an ulterior motive or is out to cause harm. The honeymoon turns into a nightmare, and it’s worse when they return home and try to deal with what they have done. But I wondered what kind of relationship they had in the first place, such strain, so many secrets. What’s with him having hiding places and her knowing all of them? I couldn’t really decide if I liked this book or not. There were a lot of twists and turns and surprises but at least part of the ending was already known. The deliberate pace and attention to detail that worked well in building suspense also made many chapters plain boring, too full of information that added nothing to the plot. I couldn’t put the book down, but I think that was due more to that overall sense of dread and anxiety and just having to know exactly how the author would wrap things up. However, the ending and afterward were disappointing. They felt rushed and left us with a platitude. Thanks to LibraryThing for provide a copy of Something in the Water for me to read and review. This review is entirely my opinion. Can you trust the one you love??? I completely enjoyed this author’s debut novel. This book grabs you right in the beginning as Erin is digging a grave. But why? Erin and Mark seem to be a typical happy couple. Satisfied with their career path, much in love and anticipating their wedding and exotic honeymoon. But all is not as it appears. When Mark loses his job right before the wedding their worries begin. 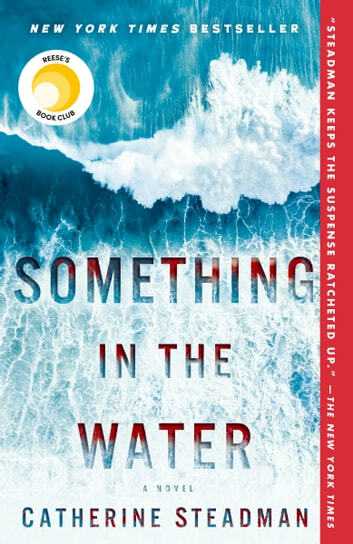 On their honeymoon, they find something in the water. They face the ethical question of what should be done with it. This find begins many events in their lives. There are many twists and turns in the story. I’m looking forward to reading more from this talented new author! It was tedious and very unbelievable . I like a good mystery but this was just too unreal. And Not something I would recommend.